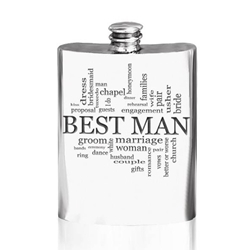 Our Best Man Words Pewter Flask 6 Ounces measures 4.72 inches tall by 3.54 inches wide. The 6 ounce pewter hip flask is all about modern styling to create an overall beautiful effect that makes for a great gift for the best man at any wedding. The hip flask cleverly uses many words that resemble a wedding to create a beautiful looking design on the front off the hip flask. Supplied in an elegant cream and black presentation box this stylish hip flask is sure to be well received by your loved one on any occasion.